The publication of this book marks the 200th anniversary of the wrecking of the Arniston,an English Indianman that ran ashore in a southeasterky gale on 30 May 1815 with the tragic loss of 372 men, woman and children. Some forty years later people came to live in sheltered coves not far from where the Arniston had met her end. The small community, drawn from various walks of impoverished life, had found their way to the sea where they could subsist as fishermen. They used lines and stones fish traps,and later also nets. In time they had boats, which were rowed and sailed,and gradually the community grew and prospered. 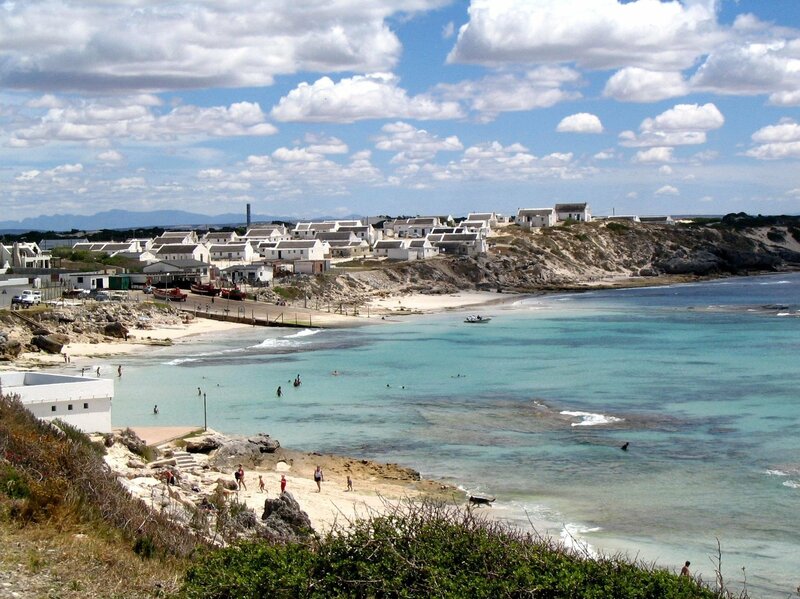 In due course the place they had made their home became the village of Arniston, also known as Waenhuiskrans. A slipway was build and there were bigger boats with engines. Situated in the Strandveld, on the southern extremity of Africa, beyond which the Agulhas Bank is at its widest, the warm sea that washes its shores delivered generously to the fishermen, but in its angrier moods it took its toll of vessels, sailors and fishermen, the most famous, the Arniston, being the one. This book about Arniston tells of many of those disasters, but more specifically it deals with the early days of the village, its development,its character and the lives and fishing tales of the fishermen and their families. Included also are anecdotes and descriptions of former near neighbours, Ryspunt and Skipskop, both of which were closed to the public some thirty years ago following the decision to locate Denel Overberg Test Range to the northeast of Arniston. They too, as well as some of the farms in the district, form part of this history. 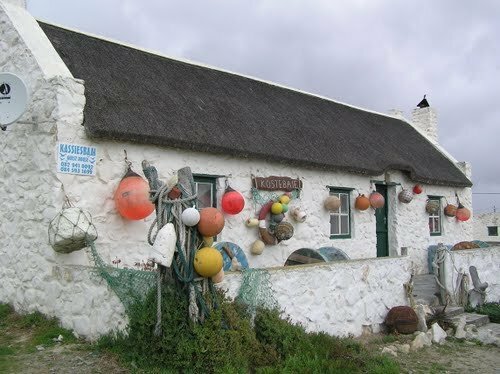 Arniston incorporates the historic fishing village of kassiesbaai,the only example in South Africa of a largely self – sufficient coastal fishing community that exhibits the original fishermen’s way of life and interaction with the environment.It is a Grade 1 National Heritage Site – the highest recognition for a key site of exceptional national significane. 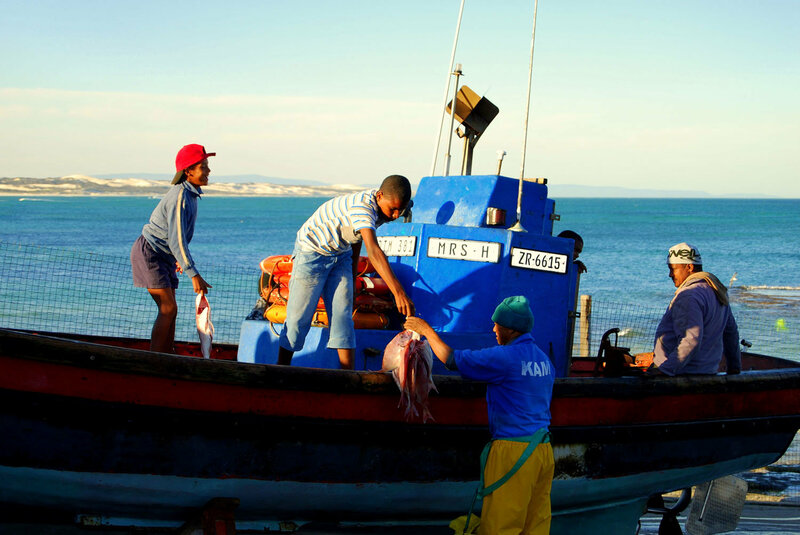 Kassiesbaai was established by the fishing community that came to live there. They supported themselves in a subsistent manner, and and their descendants continue to do so today. Despite the struggles with colonialism and forced removals that so many other communities were unabke to withstand, the people of kassiesbaai still live in the place and manner of their forefathers. However,a problem has emerged – one that continues to become more serious. Fishing, the activity on which the people and the village have depended since inception, is diminishing in viability. Fish stocks, largely as a result of commercial trawling, have become depleted and, coupled with the high cost of fuel, boats are going to sea less frequently. Kassiesbaai, which has survived the adversities of past injustices and the challenges of poverty, is part of South Africa’s rare and irreplaceable heritage. It must be conserved and managed effectively in a sustainable fashion for the sake of its community and for future generations. If Kassiesbaai and its people are to survive they will need help, and always and means of doing so are being investigated. One that is being addressed by the Waenhuiskrans/Arniston Community Development Trust is financial assistance to students from Kassiesbaai for further education at various academic institutions. The cost of this book have been fully covered by donations. As a result of their generosity all revenue generated from sales will be made available for educational bursaries for the fishing community. In essence though, this is the story of a picturesque fishing community that has retained its character and of a beautiful holiday village, where all live in harmony and where English and Afrikaans are equally at home. Cape Agulhas Tourism has received stock of this book for just R280, that tells the wonderful heritage story of Waenhuiskrans/Arniston.